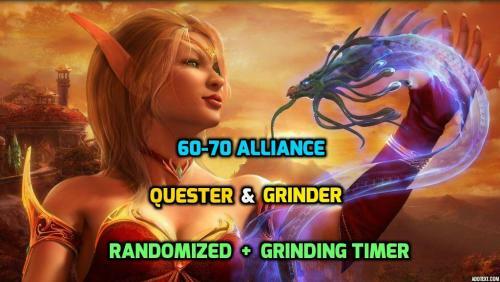 This is my 60-70 TBC Alliance Quester + Grinder Launch. There are roughly 280 quests in the profile and i enjoyed making it so much that I'm going to release Horde next! I have included my 1-13 Draenei Demo as a demonstration of my work. Please turn off "Blacklist groups and highlevel mobs"
Please turn off "Use Smart Pulls"
These settings have been confirmed to cause problems for the bot! The bot will randomly select a grinding location each time the bot is started, and reaches the code where it selects. A new Timer was added to prevent bans - Average of 40 minutes in 1 location and the bot will re-select a new spot. Randomized Grinding with a 40-60 minute timer when grinding. Over 280 Quests in the profile. All hand done. "Interact with NPC or Object" Quests have their very own RunCode because TBC is odd when it comes to Wrobot. Dozens of custom codes to make sure each quest is done proper. Level Restrictions - To speed up load times. There are 4 level RunCodes that will be ran if the bot meets the specified requirements - he will do the following quests. You can turn this off by unchecking the code if you want the bot to do everything (green quests etc). Bot will automatically Remove quests from the Quest log due to Auto Pickup. Usage of Hearthstone, several times. Automatically bind you when you reach a new questing area. Bot will pickup key Flight Paths - Custom code. Zangermarsh Elevator - I implemented a special code just to get the Flight Path in Zangermarsh, And will do the same for Netherstorm Elevator next update. On-Screen Display to tell you what is happening at "KEY" points of the profile. In order to improve load times, i will not be placing this for each quest. Custom blacklisted Areas + Mobs. Detects if you have 300 skinning, and will automatically level up at the trainer. Do Not Sell List - I've implemented a custom code at the beginning of the profile to prevent the selling of several valuable items that could net you some awesome gold / Reputation. Profile is mostly questing. In the event that you must grind - There are 4+ grind spots the bot will choose from for each level range. Many private "Follow Path" codes to prevent the bot from dying. @Schaka - For helping with some of the Intereact with NPC code. Fixed major issue with level 67 + questing and grinding.